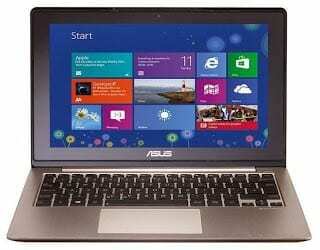 Asus Vivobook S200E are compact Windows 8 laptops with stunning 11.6-inch touchscreens. With precision touchscreen, smart gesture touchpad and full-sized keyboard, the Asus Vivobook S200E offers the unique Windows 8 experience. Vivobook S200E comes in a sleek and light design with a metal-treated surface. Windows 8 was built for the touchscreen world with its unique ‘modern UI’ with live tiles. The Asus Vivobook S200E unleashes the power of Windows 8 with its brilliant 11.6-inch LED backlit Touchscreen with 1366 x 768 pixels resolution. Depending on configuration, the Asus Vivobook S200E features Intel Celeron, Pentium, Core i3 processors with 2GB or 4GB of onboard RAM. 320GB or 500GB built-in storage is provided via hard drive. You also get up to 32GB free cloud storage from ASUS. Asus Vivobook S200E notebooks feature HDMI port, 2-in-1 card reader, VGA, Ethernet, Wi-Fi 802.11 b/g/n, Bluetooth 4.0 (optional), USB 2.0 ports, USB 3.0 port, and an HD webcam. Asus Vivobook S200E laptops are available in Nigeria at reputable retail outlets and online stores in Nigeria. Asus Vivobook S200E laptop price in Nigeria ranges from N68,000 to N110,000, depending on your location and the configuration of the laptop.